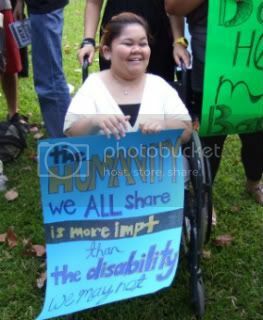 About 30 Singaporeans gathered at Speaker’s Corner last saturday, urging the government and society at large to do more for disabled Singaporeans. This event is part of MARUAH’s campaign titled “Me and My Friend”, to raise public awareness of issues faced by disabled Singaporeans. The campaign also includes an exhibition at Public Arts Square (Citylink Mall) from 10 December 2009 to 10 January 2010 and a free movie screening at Golden Village (Great World City) on the 14th December 2009. Former spokeperson of Challengeds’ Alliance Network (CAN), Ravi Philemon, expressed his disappointment at the lack of progress in the public campaign for public transport subsidy for the disabled. Despite the effort of some MPs sending letters to the relevant agencies, nothing has been achieved, he said. The first public call for subsidised public transport for the disabled dates back as long as 10 years. In 2000, public transport operator SMRT responded by emphasising the need to be “prudent about extending any travel concessions beyond the present eligible groups” because “concession fares are cross-subsidised by full-fare paying passengers with no direct subsidy”. “This is unfair,” said Mr Philemon. Many disabled Singaporeans earn very meagre salaries. While they spend as much as S$5 per day, their monthly individual income can be as low as S$100. Up to 75% of their salaries is spent on public transport. The issue of Blind Card was raised by one of the speakers, Mr Rahmat. His social worker had provided him a Blind Card which helps him to get free rides on the public transport system. However, this is not an official scheme, so blind people are at the mercy of ground staff and bus drivers in the public transport sector. The unwritten rule of free ride for the blind dates back to the time when Singapore was a British colony. However, this rule is not always observed as there are foreigners among public transport operator’s ground staff and bus drivers who are not familiar with local customs and practices. On education, Bramae Mathi of MARUAH said that allowing disabled students to enrol in the same school as normal-bodied students enables normal-bodied students to “build up an ability to include them [the disabled] in our social sphere”. She also expressed her concern that disabled children are exempted from the Compulsory Education Act. According to Wong U-Wen of the Deaf and Hard-of-Hearing Federation (DHHF), many Singaporeans have little knowledge of deaf issues. In the USA, the deaf are allowed to drive cars but they are not allowed to drive cars in Singapore. For some reason, the public appears to be more sympathetic to the transport needs of the blind than that of the deaf. He also expressed his frustration on employment discrimination in Singapore. Despite 20-years of experience as a mental health and social worker in the USA, he found that his perspective employers were more concerned about his loss of hearing than his ability to work. “I have deaf friends in the USA who are lawyers, doctors and university academics,” he said.